Finding a restaurant where taking along the dog is part of the ambiance is nothing short of wonderful. The places listed below vary in how much space they have for Fido, but they all offer some sort of patio seating where it's not only okay to have a loyal companion, but it's often encouraged. When you've finished dining, take your dog out to a nearby dog park and pass the frisbee around. Baggins specializes in sandwiches, both cold and grilled, from BLT to the Cubano and meatball sub. It also offers deli sides and salads and a limited delivery service. Their dog-friendly patio is a great place to eat in fine weather. What started as a brewing company under the name of Il Vicino in 1994 became the Canteen Brewhouse of today. After 20 years, this taproom is still going strong with the same award winning beers, under a different name. Grab the dog and enjoy the patio at the brewhouse located in Albuquerque's Brewery District. The 70-seat patio is not only great for you and the dog, it's also a good spot to enjoy live music. The distinctive adobe building that dates to the 1700s is now a charming cafe specializing in New Mexican food. Try their award winning salsas. A shady patio contains a fountain and a relaxing atmosphere just right for dining with your canine pal. El Patron offers New Mexican cuisine, so expect enchiladas, tacos, and burritos, but they also carry gluten-free and vegan dishes. Their happy hour is every night from 3 p.m. to close in the bar. An outdoor patio with umbrellas is the perfect place to sit and enjoy the evening with your dog. See more about Flying Star restaurants and what they offer in the way of menus and desserts. The dog-friendly petio at Gecko's in Nob Hill brings together man's best friend at a space that welcomes friends. The Grove Cafe in Albuquerque's east downtown features breakfast and lunch every day but Mondays. The food is fresh, local and organic. Their patio is dog friendly. Il Vicino's wood oven pizza brings customers back again and again, and their Nob Hill location has a pet-friendly patio. Kelly's in Nob Hill offers breakfast, lunch, and dinner as well as their handcrafted beers. Their patio is popular day and night, and dogs are always welcome. O'Niell's has two locations, one in Nob Hill, one in the northeast heights. Both offer patios where it's easy to relax under an umbrella, enjoy some food and drink, and bring the pet. 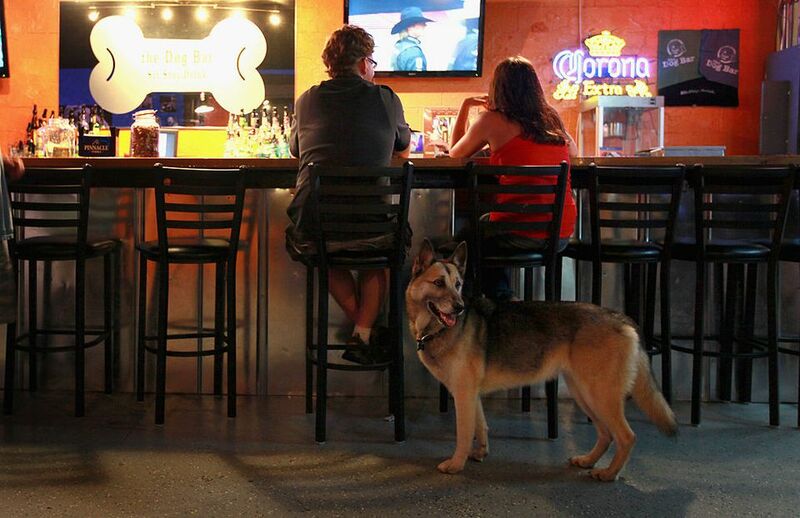 Rock and Brews has large, open heated patios where pet friends are welcome. The restaurant has a full bar with local craft beers. For kids, there is a play area, and the atmosphere is pure classic rock and roll. The craft brew pub has locations in Nob Hill, Wells Park, West Side, and Four Hills, all of which welcome dogs provided they're leashed.